We all have that special someone in our lives that is either a devoted cook/home baker who loves being in the kitchen whipping up something fantastic, or is a fan of food who take real pleasure and delight in sampling the very best morsels. Whether it is you, a friend or a family member, if you know a foodie then you’re in luck since there is such a plethora of gifts and gift ideas out there that they are sure to love. From wine, to cheese boards, from a hamper to the latest kitchen gizmo, shopping for somebody that boasts a true appreciation of good food couldn’t be easier. Here are just a few ideas to get you started. If you know a wannabe wine buff who loves to swirl a merlot lovingly round their glass, then this gift could be the perfect one for them. The Final Touch Conundrum Wine Decanter is priced at a reasonable £30 and is certainly eye-catching with its gorgeous and unusual shape. Aside from looking like a piece of modern art, this decanter also provides the perfect way to effectively aerate wine. Aerating a good wine before partaking in it is important since it means that you will be able to experience all of the different depths of flavour when you are partaking in it. 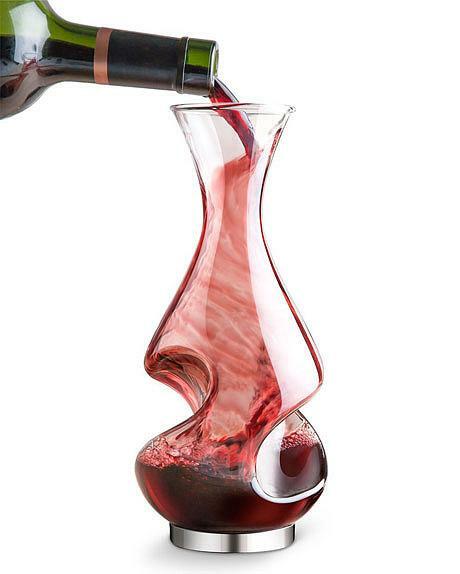 Thanks to the clever curves of this decanter, it means that more wine is exposed to the air as you pour it in and out, meaning that it is better aerated when you are drinking it. If you have a friend who absolutely adores their food, but only of the very best quality of course, then how about gifting them with a sumptuous hamper? From up market high street shops to online services, you can easily order one to your specifications. Or, alternatively, if you have a bit more time on your hands, then how about making up your own food basket? You will be able to pick up a basket at second hand shops, charity shops or even garden centres, and once it is lined with some pretty gingham fabric with a bow on the handle, then you are ready to fill it up with all of their favourite things. Feel free to make some of your own offerings for it as well, for example your special secret recipe biscuits or some homemade strawberry jam. The person that receives the gift will be thrilled that you put so much effort into it to make it truly special. Finally for the baker in your life, how about gifting them with a gorgeously fancy apron? Most bakers probably will have an old, grubby and somewhat tired looking apron that has seen a cake or two in its time, but there is nothing like catering to their hobby with a lovely fresh and new apron, with perhaps a matching oven mitt and tea towel. Again, they will be grateful that you have bought them something that they can use and put some thought into it. If you are crafty and a good hand with the needle, then you can always make them a unique apron that is perfectly catered to their tastes!